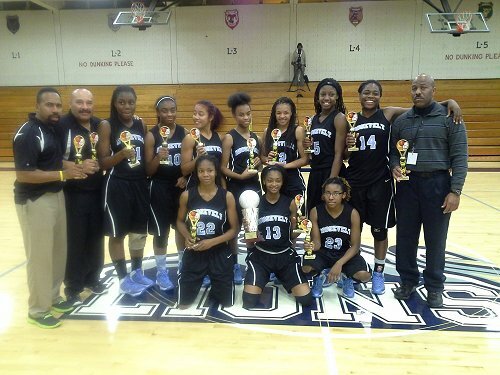 Congratulations to Coach Delton Fuller and Eleanor Roosevelt’s Lady Raiders for winning the 41st Annual IAABO 134 Girls Christmas Tournament Invitational. After 2 days of rigorous competition the Lady Raiders of Eleanor Roosevelt faced off against the Mount Vernon lady Major’s. Both teams brought their A game along with a lot of energy. By half time the Lady Raiders led by a mere 7 points. Unfortunately, for Coach Coffer and his girls that would be as close as they would get. In the end Eleanor Roosevelt took control of the game and won by 11, Eleanor Roosevelt 64 – Mount Vernon 53. It was an exciting game to watch and we are thankful to all the enthusiastic fans who showed up and cheered on the girls!! The Lady Raiders had three players in double figures: Octavia Wilson with 22 points, Kaila Charles with 20 points and Tolulope Omokere with 17 points.